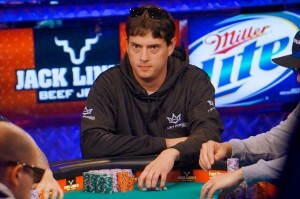 Out of the remaining nine players left in the 2013 WSOP Main Event, Jay Farber is by far the biggest amateur. The Las Vegas-based VIP host battled through a 6,358-player starting field to make the ballyhooed November Nine. When play resumes on November 4th, he’ll have a shot at the $8,359,531 first place prize. It certainly wasn’t easy for Farber to get here though. He played 70 hours of poker in one week, including 16 hours on the day the Main Event final table was finalized. He also suffered a horrific bad beat at one point, making things seem grim for him and his entourage. He didn’t give up though and began winning back what he lost. “I was just playing my style of poker and it seems to have been working out really well for me,” he said. Once the Main Event was whittled down to 10 players, he pushed even harder and picked up extra chips. Now he’s got the fourth largest chip stack out of the remaining nine grinders with 25,975,000. “Everybody that I’ve gotten to know from living here over the years came out to sweat me today,” Farber said. “It was so awesome. I’m so happy I can make it for them, even more than me.” Now Jay Farber will be hoping to parlay his great WSOP Main Event run into a multi-million dollar payout come November. Eight years ago, Mark Newhouse was on the path to poker stardom. Three months after final tabling his first WSOP event, the 21-year-old went on to win the 2006 WPT Borgata Poker Open along with $1,519,020. With a bankroll worth well over a million dollars, Newhouse took his game to the L.A. Commerce Casino. Newhouse’s plan was to spin his profits into an even larger bankroll through cash games at the Commerce. Unfortunately things didn’t work out quite as planned since the young grinder “lost his mind” and set his money “on fire.” As Newhouse attests to, he wasn’t very smart with his winnings and this cost him. But the Chapel Hill, North Carolina native never gave up on poker. He’s continued to play professionally for the past decade through a mix of online games and traveling between L.A and Las Vegas. He’s sporadically played tournaments during this time as well and decided to enter the 2013 WSOP Main Event. With 7,350,000 chips, Newhouse’s odds of winning the 2013 Main Event aren’t the greatest. He’s miles away from chip leader J.C. Tran (38 million chips) and the second shortest overall stack at the final table. But win or lose, Newhouse has already accomplished quite a bit just by making it this far. And even if he busts out in ninth place, he’s still guaranteed a $733,224 payout. Since 2008, the World Series of Poker has been running their Main Event under the November Nine format, where the final nine players meet in November to decide the tournament results. Of course, since the first portion of the WSOP Main Event ends in July, this creates a four-month gap before the final table is decided. It wasn’t always this way though since the WSOP used to run the Main Event and final table within the same two weeks. However, the change was made in 2008 to create more buildup for the tournament, and help ESPN earn higher TV ratings. But after four years with this experiment, WSOP officials are starting to wonder if the November Nine format is turning people off of the Main Event. The 2011 WSOP Main Event final table will meet this Sunday to determine who wins the $8.7 million top prize. So far, no drop-off is expected in the ESPN ratings since enthusiasm is high for the final segment of the tournament, but if the WSOP notices any drop at all, they could be going back to the regular format. That said, most poker fans would probably welcome the change because that way, they wouldn’t have to wait four months just to see the tournament play out. But we’ll have to wait and see what the WSOP and ESPN end up determining in the end. Posted in Poker News, Poker Tournaments | Comments Off on WSOP November Nine Format Gone? After 78 strenuous hours over 8 days of poker sessions, the Final Table for the WSOP 2010 Main Event has finally been determined. The final nine players, known as the “November Nine”, are set to compete on ESPN on November 9 of this year. So who made it? Read on to find out. Seat 1 – Jason Sentl is a 25-year old professional poker player from St. Louis Park, MN. This is Sentl’s first time to cash in a WSOP event. Seat 2 – Joseph Cheong is a 24-year old professional poker player from La Mirada, CA. He won a WSOP Circuit gold ring three months ago. Seat 3 – John Dolan is a 24-year old professional poker player from Bonita Springs, FL. He has a total of 6 WSOP cashes, including three this year. Seat 4 – Jonathan Duhamel is a 22-year old professional poker player from Quebec. If Duhamel wins, it will be the 6th gold bracelet-win for Canada this year. Seat 5 – Michael Mizrachi is a highly successful and well-known poker player. At 29-years old, he won his first WSOP bracelet in this year’s Poker Players Championship. Seat 6 – Matthew Jarvis is a 25-year old professional poker players and student from Surrey, BC in Canada. He primarily plays online poker and this is his first time cashing in the WSOP. Seat 7 – John Racener is a 24-year old professional poker player from Port Richey, FL. He is well known on the national WSOP Circuit, and won the Main Event championship victory in 2007 at Harrah’s Atlantic City. Seat 8 – Filippo Candio is a 26-year old professional poker player from Cagliari, Sardinia in Italy. He is the first Italian to play at the WSOP Main Event final table. 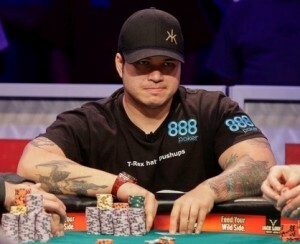 Seat 9 – Cuong “Soi” Nguyen is a 37-year old medical supply salesman from Santa Ana, CA. He is the only amateur to make it to this year’s final table.